What makes expert chess players able to remember the details of so many games? Practice and memorization help, but at the end of the day, chess grandmasters say that pattern recognition is the tool that helps them win games. Certain board dynamics repeat themselves throughout all chess games, and chess players learn to recognize those patterns. In fact, they don’t focus on the specific pieces at all. Rather, they observe the more abstract relationships, strengths, and impressions. Chess grandmasters and successful investors identify patterns better than other people. Learn how to identify your patterns in dealing with your finances, and how to replace them with successful patterns in building wealth. Imagine if you sat down across the table from a worthy opponent and before the game began, the arbiter handed you a blindfold and asked you to put it on. He agrees to verbally tell you the moves that the other player makes and you just have to keep them all in mind. Could you do it? Consider this amazing story: In 1939, chess grandmaster Miguel Najdorf left Europe to represent Poland in an Argentinean tournament. Two weeks after he arrived in South America, Germany invaded his homeland and he couldn’t return. Had he gone back, he would have likely been killed by the Nazis, as happened to his immediate family. Unable to make contact with any relatives in Europe, he wanted to find some way to alert people that he had survived the war. He arranged an exhibition where he played chess against 45 opponents simultaneously. To make the event even more newsworthy, though, so that he could feel confident that it would be reported in Germany, Poland, and Russia, he played all the games never looking at a board – blindfolded! Though some might assert that a photographic memory makes the feat possible (which grandmasters deny), and others claim that years of practicing blind chess allows them to put on such a show (which grandmasters also refute), the fact is that certain board dynamics repeat themselves throughout all chess games, and chess players learn to recognize those patterns. In fact, they don’t focus on the specific pieces at all, which is how amateurs try to memorize boards, thereby frustrating themselves. Rather, they observe the more abstract relationships, strengths, and impressions, much like a musician relates to the chord structure of a piece. The financial world, too, consists of patterns that regularly repeat themselves, and a trained eye can frequently recognize and exploit them. In the 1940s, a Dutch psychologist and chess expert, Adriaan de Groot, discovered that chess grandmasters neither thought significantly more nor faster than lesser players, and their memories were not particularly superior either. Rather, they could spot patterns better than others. Breaking down complex ideas into manageable pieces of information was eventually given the title “chunking,” and was the concept that led to a Nobel Prize in economics for Professor Herbert Simon (1978). Successful investors know how to parse information and recognize patterns in the financial world. 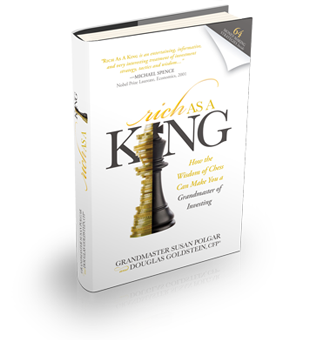 Rich As a King, using chess to illustrate the concept of pattern recognition, will help you manage your accounts like experienced chess players. Of course, it might be difficult to break records like Miguel Najdorf did in Argentina. But Susan offers some of the tips that she got directly from Najdorf over a holiday dinner in 1993 when he recounted to her how he tried to send the message to his family that he was still alive by winning 39 of the blindfolded games, reaching a draw in four, and losing only two!